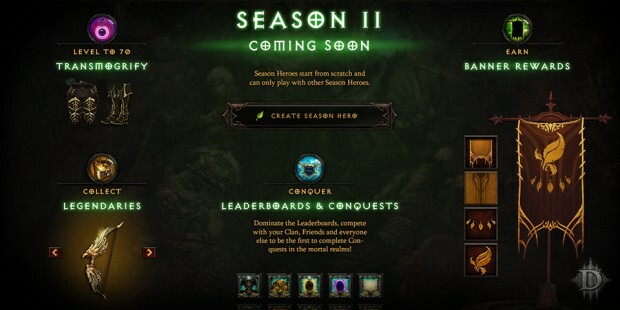 Season 1 in Diablo III will be completed next Tuesday, February 3, and we now know the start date for the next season. Season 2 will begin on Friday, February 13. The exact time that it starts varies by Diablo III region. The new season will have the Season 2 Legendary items and class changes that were part of Patch 2.1.2. Get ready, because Season 2 will be here in just two weeks! Season 1 is about to draw to a close, and we wanted to give players an opportunity to prepare for the start of the new season with some dates and times to plan around. For time zone assistance, click here. We look forward to seeing you in Season 2! *Please note that Era 1 will end at the same time as Season 1. For more information, please click here.